Let the Panda Magic help you with 100% Match + 50 Free Spins! What happens when you combine the animal kingdom with the powers of sorcery? You become an instant weekly winner of a 100% Match + 50 Free Magic Panda Spins! Deposit $35 from Monday through Friday and you'll be spinning the reels of the magical Panda Magic slot. Free games, bonus features and progressive jackpots are all possible with the help of symbols such as mushroom, a wizard's hat, a Chinese Castle, book of spells, a crystal ball and candles. The Magic Ticket is the scatter symbol and the Panda Magic is the wild symbol. 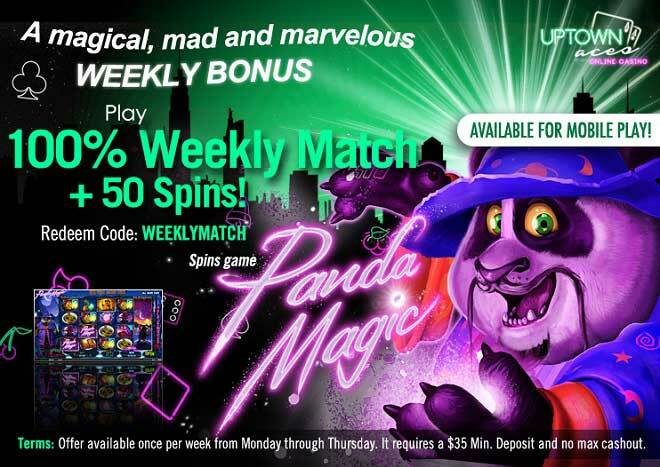 Let the Panda Magic help you cast a winning spell on your account with a weekly 100% Match and 50 Free Spins!